A piece of tenderloin, an eggplant and a little quick from the kitchen trays were what I had at your disposal. I was the great result after a long and delicious stroll-Saturday in Oslo. The result made more than staggering hungry. This was light gourmet! 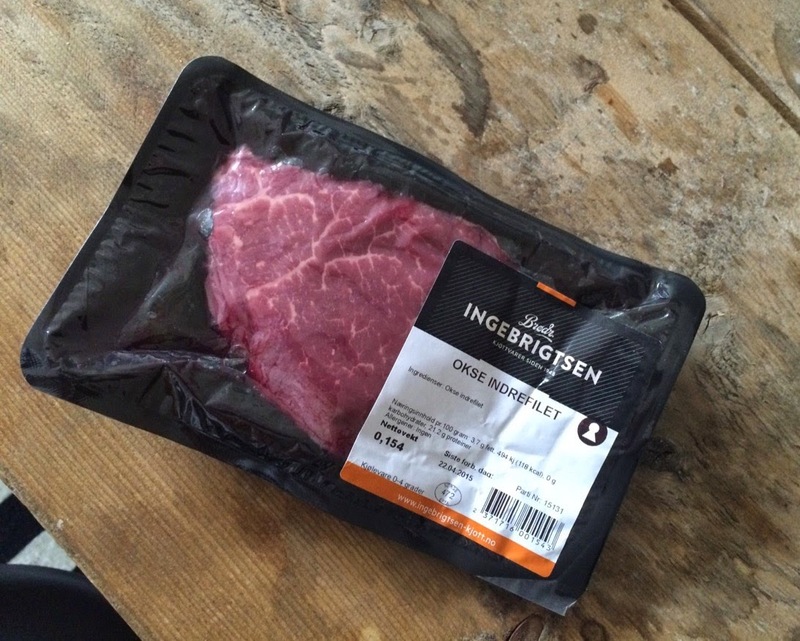 The steak I received from a friend, fled from Tromsø (both he and the meat piece). Good marbled to tenderloin to be and similarly tender. Lovely! Wipe the meat with dry paper and let it temper for about 20 minutes on the kitchen counter. Then cut the eggplant into 1 cm thick slices lengthwise. Put on salt and let this pull out while the steak is frying. Season with salt and pepper on both sides. Warm oil (rapeseed oil is a healthy frying oil) in a pan and fry the beef one minute on each side of high heat until it gets a frying pan. Turn the heat to medium and stir the steak on. Turn it every 15 seconds to cook it evenly. So have butter, garlic, rosemary and shallots in the pan. Turn the steak into the mixture to taste from these taste assortments. When the steak has a core temperature of 53 degrees, remove it and the flavors from the heat. To accurately measure the temperature, I use a so-called thermo pen. Have become totally dependent on this! Let the steak rest for ten minutes on a clean plate. Then prepare to cook the aubergines. Wipe the salt and water that has been extracted. Have some extra oil in the same pan and fry the eggplant until it is soft and golden on each side. Sprinkle the fenyal fries towards the end of the cooking time. Mix the ingredients into the chili creams. Cut the beef into thin slices on slant and serve with eggplant, fried onions and chili kesam. Garnish the plate with some green herbs (for example, parsley, spinach or rucula) and shred some lemon.